"If through some miraculous disaster every dinosaur bone in the world disappeared tomorrow, the fossil record for dinosaurs would still be represented quite well by their tracks alone... each dinosaur had, on average, about 200 bones per individual. Yet you could bet that those dinosaurs that made it from hatchling to rambunctious juvenile to surly angst-filled teenager to a full-fledged responsible adult probably made many more than 200 tracks during their lifetimes... Other than their sheer abundance, another comforting thought about dinosaur tracks is that they very often are in places where dinosaur bones are rare or absent... As a result I like to argue that dinosaur tracks constitute the "real" fossil record of dinosaurs rather than their bones, which are nice but, well, just a little too dead. Tracks breathe life back into dinosaurs." In addition to taking this interesting, but not without merit, stance on dinosaur paleontology Martin is not shy about putting his neck out on, what many of his peers may consider, reckless speculation. In fact he starts off the book with a captivating predatory clash involving a T-rex (although it begs the question did the editors insist on T-rex?) and later describing ichnology as "that exciting intersection between science and flights of fantasy... I like to argue that for us to truly grasp how dinosaurs behaved... we absolutely must study their trace fossils." Well no argument from me there. The issue of how much speculation is warranted or even necessary is a common discourse in paleontology. With extremes ranging from "we can only talk about the hard data" to the more out-there whimsical notions of the All-Yesterdays movement there is a lot of strands of thought out there. For those working and employed professionally as paleontologists I can certainly understand not wanting to be associated with such and such crazy idea. But that leaves a lot of the speculative slack to be taken up by dino-fanatics or bloggers (like yours truly) who may or may not offer the most accurate depictions in lieu of professionals not wanting to put their neck out on some unvetted idea. However I do wish that this was not the case and that the people with the most expertise and experience felt more at ease with speculation, as long as it is couched in those terms. 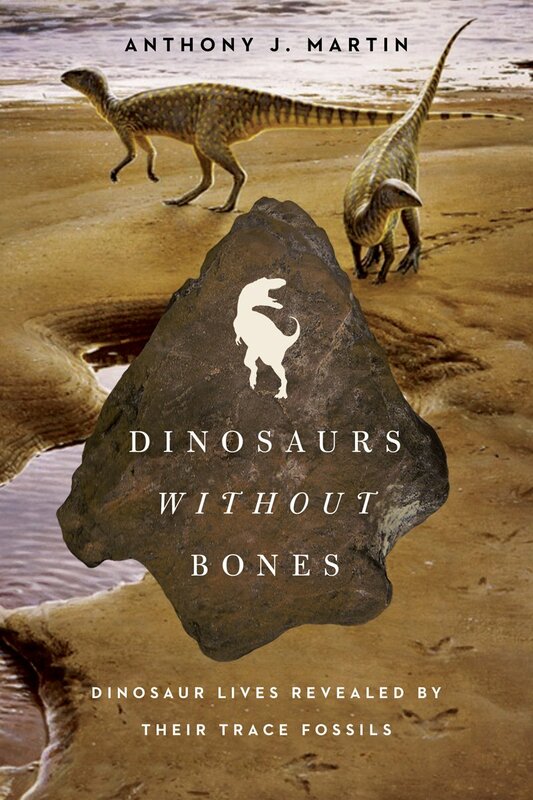 There are a lot of chapters in this book that cover a wide range of topics in dinosaur ichnology, Martin even cheats a little and looks at bones via dino pathologies and tooth abrasion. But what I want to talk about are the two chapters that I found most captivating and hopefully they will pique your interest as well so you go buy the book. 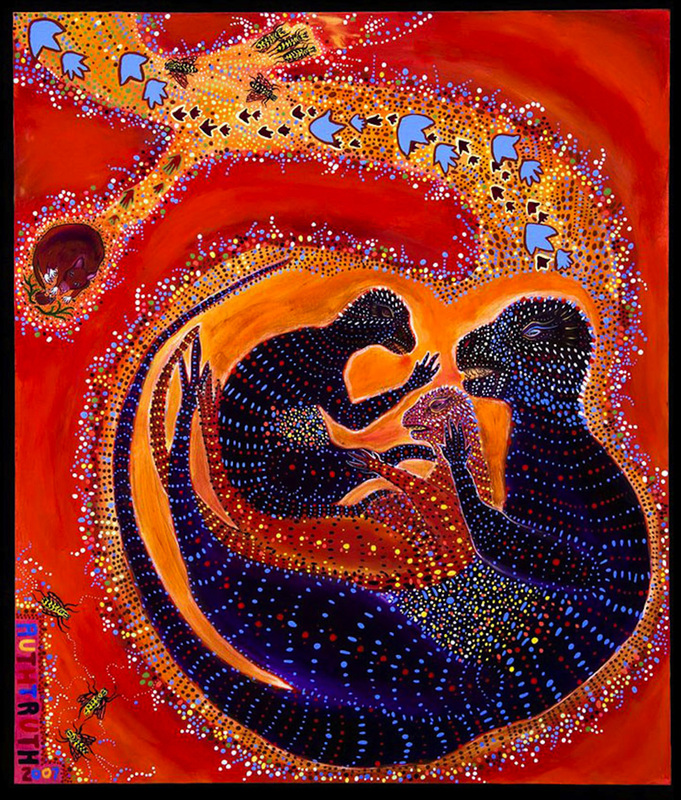 The above beautiful image by Ruth Showalter (wife of Anthony Martin) for the Spanish language book El Dinosaurio que Excavo su Madriguera (The Dinosaur that Dug Its Burrow) highlights the discoveries in recent years of dinosaur burrows, especially by small ornithopods. In the chapter Dinosaurs Down Under Martin takes you on a first hand account of the scientific trajectory of this discovery, himself playing no small part in the saga of burrowing dinosaurs. What I found so fascinating about this chapter is the wave of emotions/setbacks/triumphs involved in such a find. From careful skepticism, to ebullition, back to sound scientific investigation and the perils of publication- this chapter could have easily been expanded out into its own book. 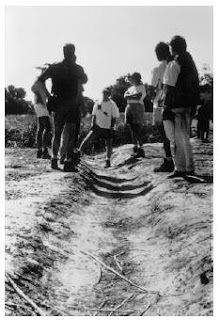 One of my favorite pieces is where Dave Varicchio, who discovered the burrowing dino and contacted Martin via email uses Martin to test his hypothesis: "Dave has used me- in an intellectually sordid way, I might add -to test his hypothesis. His exclusion of much information about the find, such as its age. location, interpretation of the original environment, and the oh-so minor detail that it involved a dinosaur, was purposeful and sneakily effective. Still, it reduced the possibility of bias in my assessing the photo and ensured that I would interpret it solely on its face value as a possible trace fossil and not as something I was hoping to see." That is science in action folks!!! Ok when I got this book I actually skipped to this last chapter Dinosaurian Landscapes and Evolutionary Traces. If you read this blog you are probably aware that how dinosaurs interacted and affected their landscape and vice versa is a subject of much interest to me. What did a sauropod modified habitat look like? Well this chapter offers much food for thought in these regards. Central to this chapter is a paper by Thulborn (2012) from Plos One and available for free. What Thulborn found was a veritable sauropod highway traversing through lagoonal substrates in Early Cretaceous, Western Australia. And these were some big boomer sauropods and they repeatedly used the same travel routes over time. How or why this paper eluded me until now and that the possible inferences drawn from it are not more widely discussed and debated in paleo circles is beyond me. By analogy from the manner in which modern multi-tonne taxa (hippos, elephants) use repeated paths- paths of the least resistance more or less - landscapes dominated by such megafauna take on certain features. Most interesting is that these trails which intersect with waterways, through repeated travels breaks down banks that confine water channels. In a sense they can, over time, reroute rivers or allow water to be more widely distributed on the landscape. Martin even uses the term ecosystem engineer!! This reminds me of two things; beavers, as you may know my sister blog southland beaver is all about that rodent (shameless self promotion new beaver revelations!!) and; the enigmatic Morrison formation, usually characterized as semi-arid but replete with numerous sauropods and a fairly diverse suite of rivers, lakes, marshes, and fens. By inference from the behavior of elephants and hippos- a 2002 paper by DeoCampo documented hippos creating an avulsion of a river, they literally created a new 30 meter wide and 2 meter deep wallow- Martin opens up the suggestion that several modern large rivers, which originate in the Mesozoic, may at least owe some of their modern shape to dinosaur modifications. A very startling and mystifying idea!! However this being a science book and me writing from a scientific perspective (most of the time) I do not think I would be doing my job if I did not offer some critique and can't just offer eulogy and praise. And the criticism is very specific on page 170 Martin, discussing holes in the head shields of ceratopsids, states: "So where the(y) *typo* delivered by their theropod contemporaries and presumed archenemies Tyrannosaurus rex? No, because Centrosaurus head shields showed almost no holes. Yet because Centrosaurus lived at the same time as Triceratops and Tyrannosaurus, it also should have been on a T. rex menu." As far as I know, unless new data has come to light, Centrosaurus was Campanian (Dinosaur Provincial Park) while T-rex and Triceratops were Maastrichtian genera. This also might poke holes (pun, pun) in the hypothesis that T. rex was not gouging into ceratopsid frills because Centrosaurus did not live concurrently with T-rex. Thanks Duane, for the turn-on. I will get this book. I gotta know all about sauropod stomping and barfing. They are already written into my new short story, "Hatching Alamosaurus" but I haven't quite published it yet, so I'd better see what Dr. Martin has to say. I want to get the dino-details right! Thanks again!